The Special Task Force along with Uttar Pradesh Police on Monday detained two suspects in Varanasi, one of whom is the key suspect, in connection with the sensational double murder case of high profile artist Hema Upadhyay and her lawyer Harish Bhambani. However, it is still not clear whether, Sadhu Rajbhar, who is the main suspect of the murder case is directly linked to the murder. According to reports, Rajbhar called Hema on Friday suggesting that he had evidence against her estranged husband Chintan Upadhyay. After their conversation Hema agreed to meet Rajbhar along with her lawyer. According to police, the bodies of Hema, 43, and Bhambhani, 65, their hands and feet tied with ropes, were recovered from a drain in suburban Kandivali on Saturday night. “We received information around 7:30 in the evening yesterday that two dead bodies are lying in a drain, wrapped in plastic looking very suspicious. Our officers went to the spot and verified the bodies,” District Commissioner of Police Vikram Deshmane told the media. Asserting that the circumstances indicated clearly that it was a case of murder, the DCP added that a case has been registered with the Kandivali police station under IPC section 302 and 210 against unknown persons. Earlier in 2013, Bhambani had represented Hema in a case after she filed harassment complaints against her husband Chintan and alleged that he had painted obscene sketches on the walls of her room. 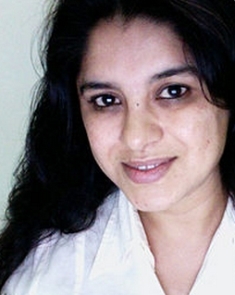 Are artist Hema Upadhyay and lawyer's murderers hiding in UP?